A hand-coloured print of St. Peter's Church in Fort William, Calcutta, from the Fiebig Collection: Views of Calcutta and Surrounding Districts, taken by Frederick Fiebig in 1851. The foundation stone of St Peter's Church, situated within the walls of Fort William, was laid in 1822. 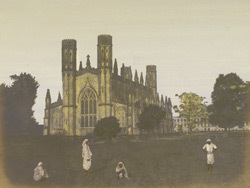 The church was consecrated in 1828 but not completed until 1835. It is a rare example of Regency Gothic in India.